I expect to the have the full version of the guide for this area on-line later in 2013. I apologize for the delays as life and other work have intervened. September and October are the transition months from late summer into fall in the NP, with respect to the weather of both warm sunny days to the cooler fall days and cool to cold nights with periods of rain, and, in some years, the possiblity of snow in October, which has occurred 23 of the last 32 years. It's also for the NPS to transition the vistor facilities, camgrounds and roads for the upcoming winter as well as preparation for possible extreme rain events with floods or snowstorms. This requires establishing and following a schedule to close all but one road and almost all the facilities through September and October, the rest closing in November. September and October are the transition months from summer to fall (September) and fall into early winter (October). September transitions from the warm, usually clear but occasional cloudy or overcast days and cool nights early in the month to cooler evening and overnight weather and cooler daytime weather with varying from clear and sunny to overcast with rain later in the month. October is the continuation of that weather to consistently cool to cold weather with more rainstorms with rain and early snow in some years with periods of clear, sunny weather, often called indian summers or just good, nice weather to visit the NP. These months can be dynamic months for weather so it is best if you plan and prepare for the extreme weather. You can get more information on the weather and snow for the NP with data for Longmire and Paradise in the NP. September is the month the NPS reduces days or hours of and closes some facilities, campgrounds, entrances and roads in preparation for the winter. The winter preparation continues through October the where by early November all of them are ready for winter with only the year-around facilities open through the winter with reduced days and hours. You can get complete information on the visitor facilities from the NPS Website and via a map of location in the NP. The same applies for the highways and roads in the NP and the state highways through the NP as for the facilities, etc., see above description. 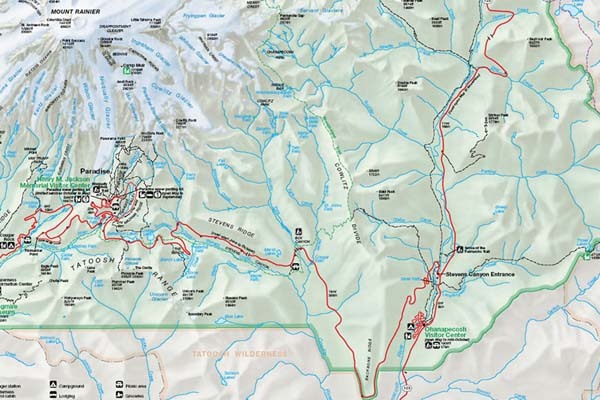 You can get more from the NPS Website on the status of roads with links to the NP's Twitter account, as well as the WSDOT Websites for highway 410 and 123 over Cayuse Pass and Chinook Pass. Through this spring and summer the NPS has been repairing and repaving the highway between the Nisqually entrance and Paradise. This work was suspended for August and September to resume in October, so there will be altered traffic patterns in September but no delays. The delays will return in October until the end of the work for the season. All of the trails will be snowfree into October and accessible through these months when and where the roads are open, see above description and links to information on road closures, especially the White River Road to the campground and Sunrise and Stevens Canyon Road between highway 123 and highway 706 to Paradise. The trails will have far fewer hikers through both months especially the backcountry trails and the Wonderland trail. Most hikers will be found on the popular trails and within a few miles of the trailheads at the visitors' areas of Longmire and Paradise. Visitors and hikers should check the weather for their visit and the NPS Website for hiking information and backcountry camping. For the most part, September and October shouldn't change your planning and preparation for visiting, hiking and photographing in Mt. Rainier NP except to be cognizant of the schedule to reduce hours or close facilities, campground and roads and the weather reports and forecasts. However, into mid-late October, the chances for significant rainstorms and possible snow in the mid-upper elevations become likely as the weather transitions into late fall and early winter into November when and where some of the earliest seasonal snow and some of worst rain storms with flooding have occurred. Ohanapecosh Entrance, Highway 123 from the NP entrance to Cayuse pass is open until closed for the season later in November. The Stevens Canyon Road will close in November or the first heavy snowfall. The Ohanopecosh visitors center is closed for the season and the campground closes in October. You can get more information at the news, access and conditions, and monthly reports Web pages.